The artist never created portraits to order. His models were friends and relatives. We see the older daughter of the painter – Olga. Surikov drew a girl in a red dress with a white lace collar. Before us is a very lively and strong girl of 10 years. She is a little clumsy, as is the case with everything at this age. Behind the heroine stove is white. It emphasizes the haze of the face. Olga’s look is open and direct. She looks straight at us. The artist was able to masterfully depict the figure of his daughter. He did not try to embellish his model. The girl’s face is pretty pretty. It is framed by lush brown hair. You can feel how soft her character. It seems another moment, and the heroine of the portrait will smile to all of us. 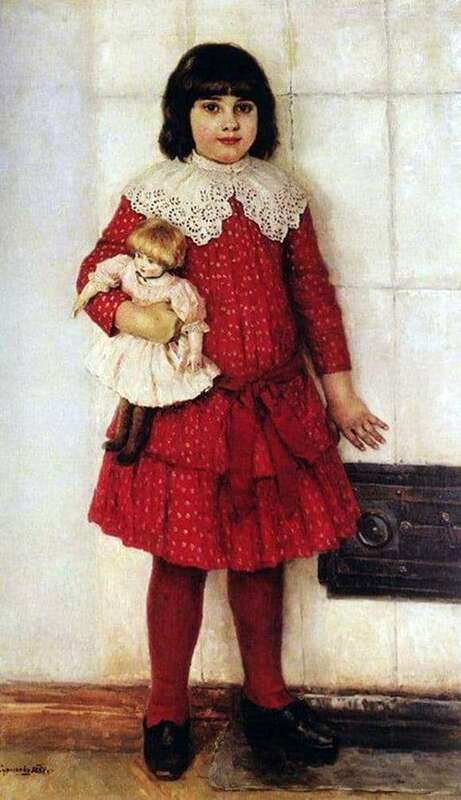 Surikov managed to catch his daughter’s temper: her special ardor and cheerful attitude. In a pose of the heroine of a portrait some waywardness and special confidence is felt. The contours of the legs are quite soft, but the artist deliberately outlines them with a solid line. Surikov depicts a still very childish figure, which still has no waist. She will appear only when Olga becomes older. The girl is standing, leaning slightly toward the audience. In the heroin, it is impossible to notice even the shadow of coquetry. But at the same time she is really graceful and as plastic as possible. One palm is pressed against the white stove. Surikov managed to write his fingers so skillfully that you can even feel their warmth. The girl presses her favorite doll. On the bright background of the dress, the cap of the puffy hair of the doll plays with a fascinating shade of gold. She is wearing a pink dress and a traditional velvet ribbon around her neck. By all indications, it is possible to determine that this toy is a Parisian. Surikov was able to create a magnificent portrait. He conveyed the liveliness of his daughter, her purity and harmony of soul and mind. You can feel that she loves her father.